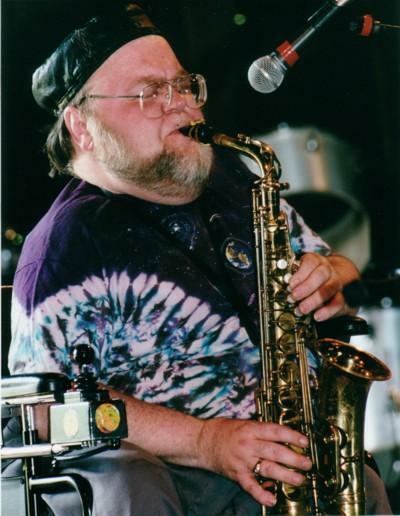 Bert Wilson was an inspiration, mentor, and brilliant saxophonist who passed on June 6 in Olympia at age 73. Some of his large output of music was featured on Jazz Northwest on Sunday June 16 at 2 PM Pacific on 88.5 KPLU and kplu.org. Although not widely known to the jazz public, he was sought out by saxophonists who regarded him as a guru of improvisation, extended techniques and the history of the instrument. He lived and worked in New York, LA and Berkeley before he settled in Olympia in 1979 where his home with flutist Nancy Curtis became the center of the jazz community. It was the site of private lessons, informal jams and public concerts. Struck by polio at the age of 4, Bert Wilson spent the rest of his life in a wheelchair (he became known as "Dr.Wheelz") but he said discovering Charlie Parker had a larger impact on his life. He also said playing the saxophone was a necessary exercise in strengthening his lungs. There will be a musical celebration of his life at the Olympia Ballroom on June 30. Also on this week's program, music by Randy Halberstadt, Steve Treseler, Larry Goldings, Cory Weeds and Pearl Django, and updates on best bets for live jazz in the coming week. Next week's program will feature a concert recorded at the Seattle Art Museum by the Eric Verlinde Quartet featuring Thomas Marriott. Jazz Northwest is recorded and produced exclusively for 88.5 KPLU by Jim Wilke. It is also available as a podcast at kplu.orgfollowing the broadcast.